An analysis is defined as the detailed examination or analysis of the structure or elements of something. Simply put, an analysis is done to find out something important about the focus of a study or experiment. There are varied reasons why an analysis is conducted and it is often due to the need to learn about something. In this article, we will get to know about a specific type of analysis called a functional behavioral analysis. Related behavior analysis samples are also included to serve as visual aid and reference to further understand the topic. You may check them out below. 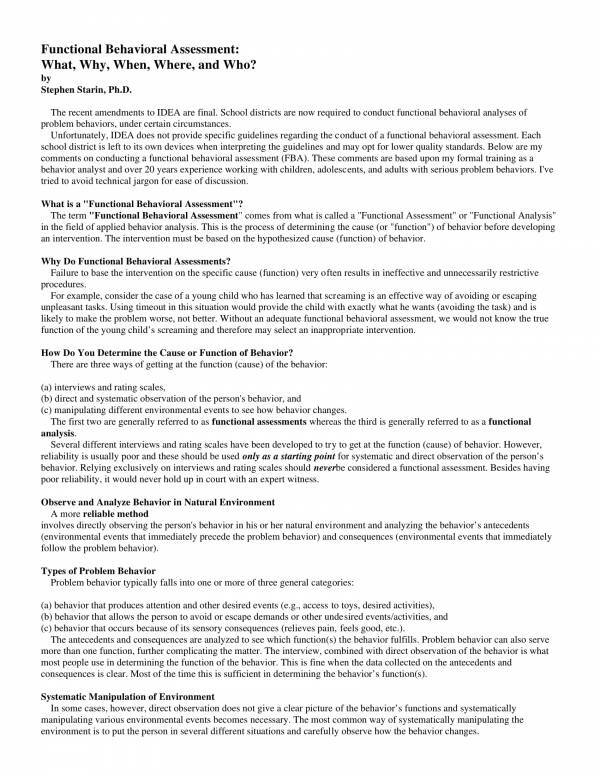 What Is a Functional Analysis of Behavior? A functional behavioral analysis is a procedure that helps identify the reasons or triggers for certain individuals to display such behaviors. 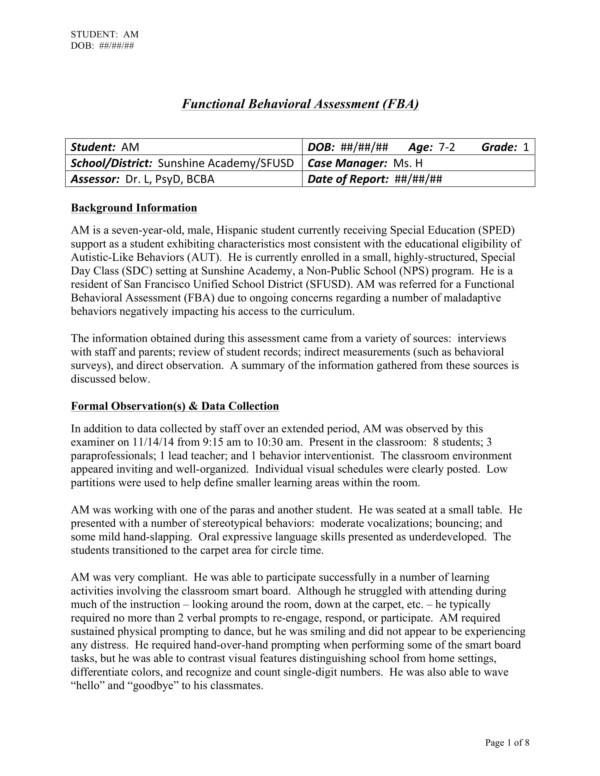 The analysis is done on individuals who display severe disabilities in cognitive skills ans communication skills. 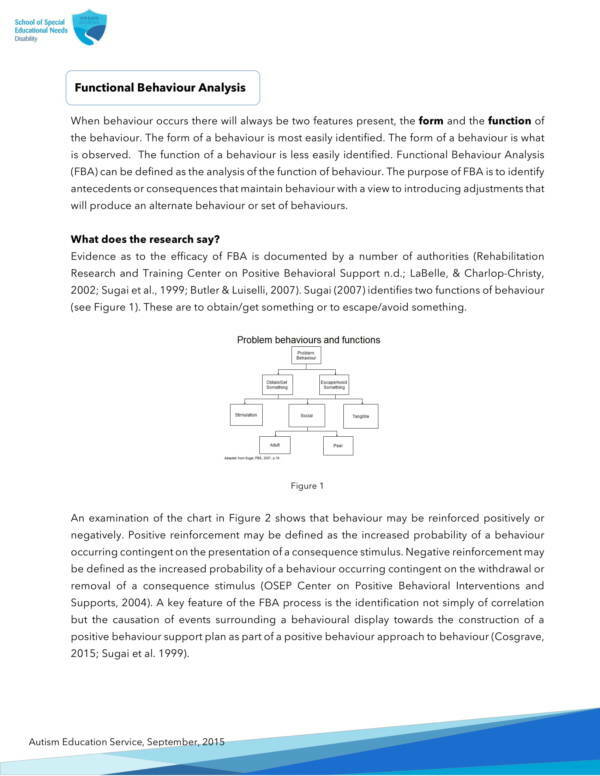 One of the reasons why the functional behavioral analysis is developed is so to explain why these individuals display such actions that they cannot explain themselves. Experiments, like introducing certain stimulus, and other external factors factors, are conducted to be able to gather data that are necessary to analyze the actions displayed by each individual. 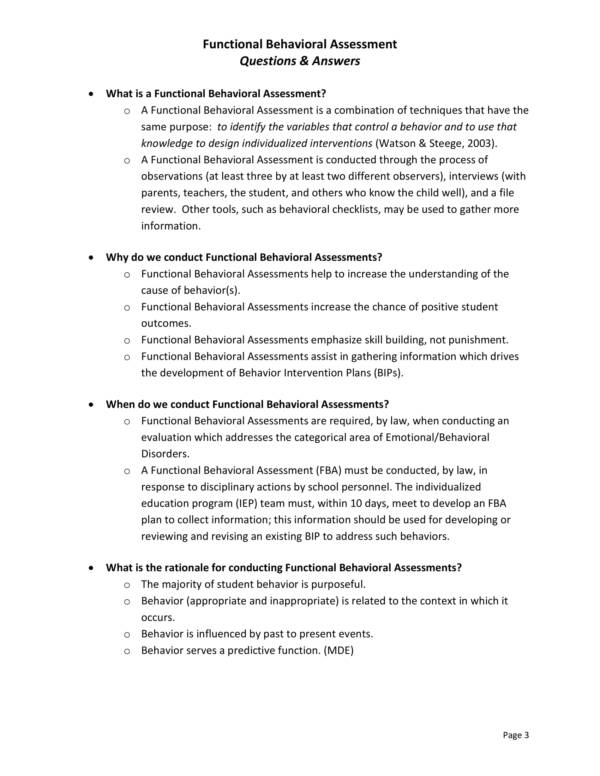 Functional behavioral analysis are used for a number of important reasons and they are as follows. 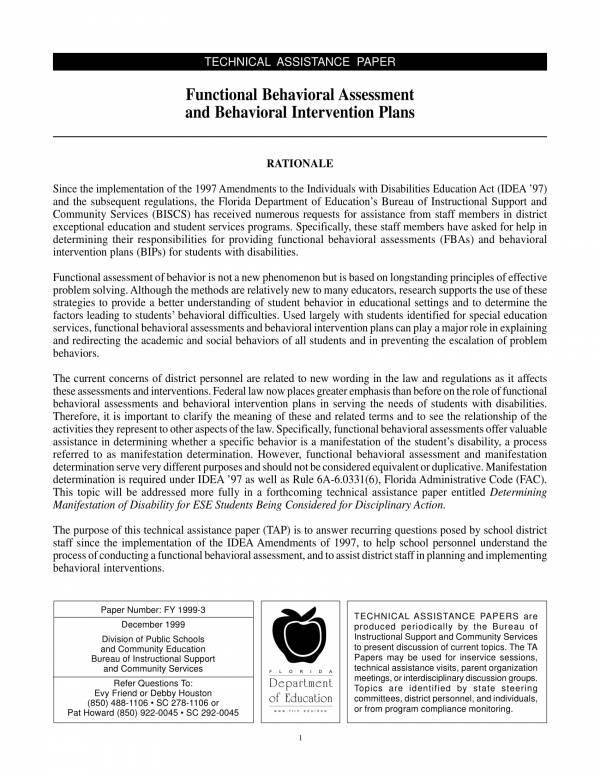 Other related articles that you may want to check out are Requirement Analysis, Sample Behavior Management Plans, and Sample Psychosocial Assessments. What Are the 4 Functions of Behavior? The four common behavioral functions are social attention, tangibles or activities, escape or avoidance and sensory stimulation. Each of these four types are discussed below. People engage in different kinds of behaviors or acts to get a certain reaction from people. Normally, individuals would do such behaviors to gain recognition or a good reaction from the people around them or from random individuals. They often do this to gain social acceptance. There are also those individuals who would rather engage in bad behaviors to get attention. They care less about being scolded as what is more important to them is getting attention. Toddlers get tantrums if they are not given what they want. They act up, scream, shout and kick just to get the things that they want (tangible items) or be brought to the place that they want to go (activity). By displaying these behaviors, children and adults alike may gain access to the things they want to obtain or be part of. When you don’t want something to happen or you want to get away from a certain situation, what you so is escape them or avoid taking part in those kinds of situations. This behavior is opposite to that of wanting to obtain something. For examples, so that children will not get injured they are not allowed to go outside to play. So as not meet a particular individual, one should avoid or stop going to gatherings that the other individual is sure to show up. Sensory stimulation has to do with internal stimulus than external stimulus. This means that there is nor need for individuals to display a particular behavior to get social attention, obtain things or escape a situation. Sensory stimulus are self-stimulating and in some way please the individual with their own doing. A common example is rubbing one’s arms after bumping it into something hard to help alleviate the pain. Find the four common functions f behavior familiar? Well, you should. You have probably experienced engaging in such behaviors at one point in your life or even until now. You may also be interested in other related articles, like Behavior Analysis Samples, Workforce Analysis, and Investment Analysis Templates. What Is the Goal of Functional Analysis? The goal of functional analysis is to determine internal and external factors that cause an individual to display problem behaviors. These problem behaviors are referred to as target behaviors. 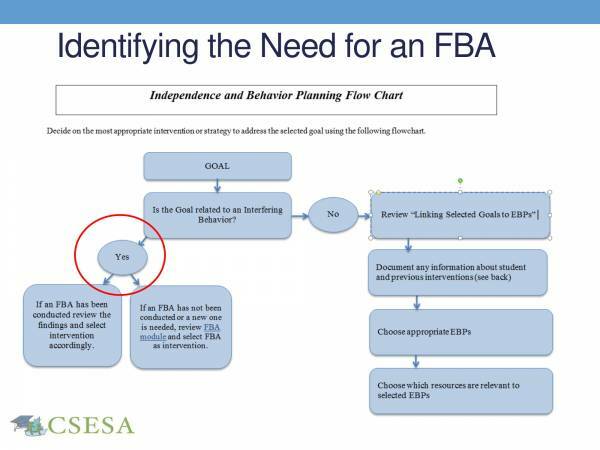 Once the target behavior has been identified, it becomes the focus of the functional analysis so that the appropriate behavioral intervention can be identified to help fix, avoid or prevent the individual to engage or display identified target behavior. The analysis is done by using indirect measures such as rating scales and interviews, observation and collection of data. Also check out other useful articles that we offer on our website. To name a few are Needs Analysis Templates, Competitive Analysis Templates, and Sample Job Task Analysis Templates. 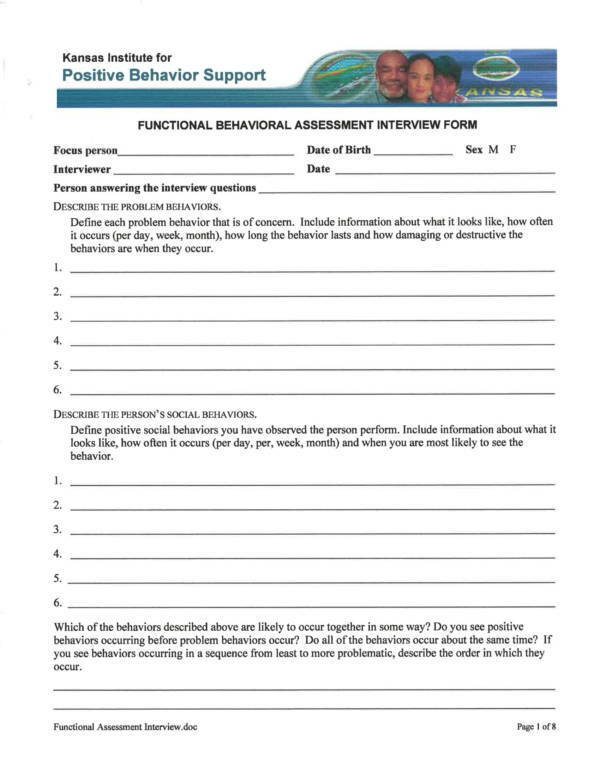 Here we have simple and easy-to-follow steps that you can use to help you write a useful and effective functional behavior analysis. Step #1: Identification of the problem behavior or target behavior. 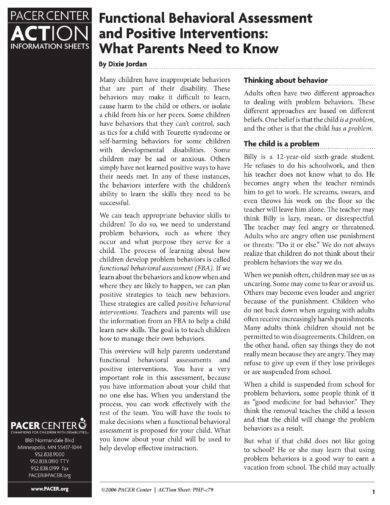 Problem behaviors or target behaviors are actions that individuals engage in that impedes their learning or educational progress and the learning of other individuals. It is important to first be able to identify target behaviors before actually gathering data and starting the analysis as it will give a clear purpose and direction as to where the analysis is headed to. 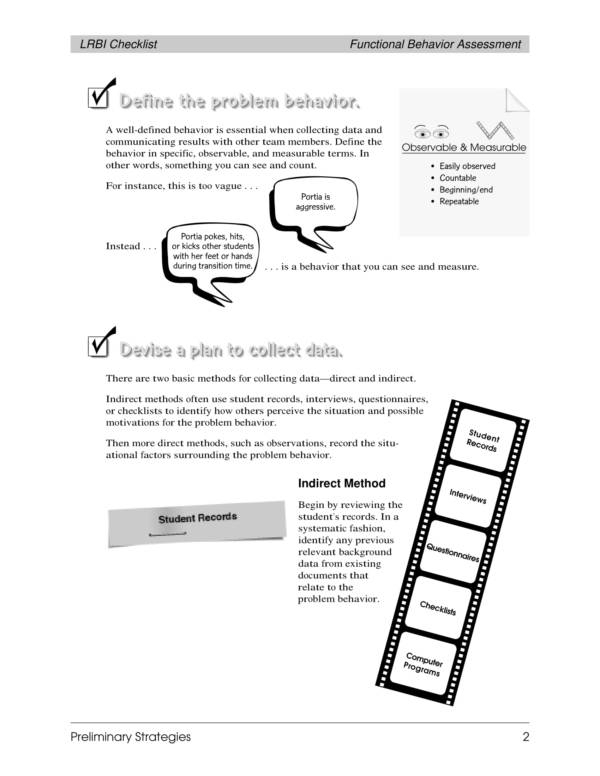 Step #2: Collection of data related to the target behavior. When does the behavior occur or take place? What are the triggers or circumstances under which the behavior occurs. 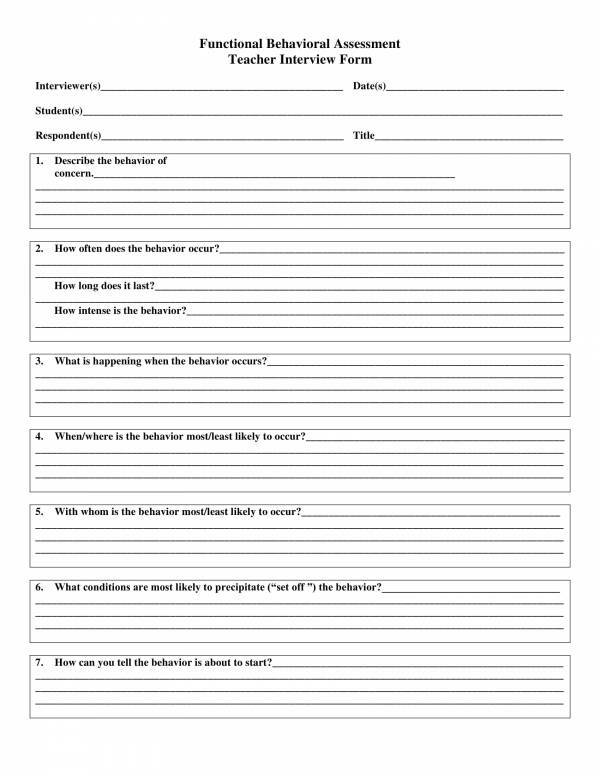 How often does the behavior occur? Can the specific interval be determined? Is there a common pattern every time the behavior is displayed? How long does the identified behavior last? When is the shortest and longest period of time that the behavior took place? Step #3: Analyzing the data gathered. Once all the required and necessary information are gathered, the next step would be the analyzation of the data. By analyzing the data you will be able to determine the purpose or the reason why that individual displays the identified target behavior, and the consequences of the behavior. The consequences for the behavior include getting social attention, obtaining tangible things and activities, and escaping or avoiding certain situations. Step #4: Writing the analysis report. All of the findings and the data gathered are recorded in an report. 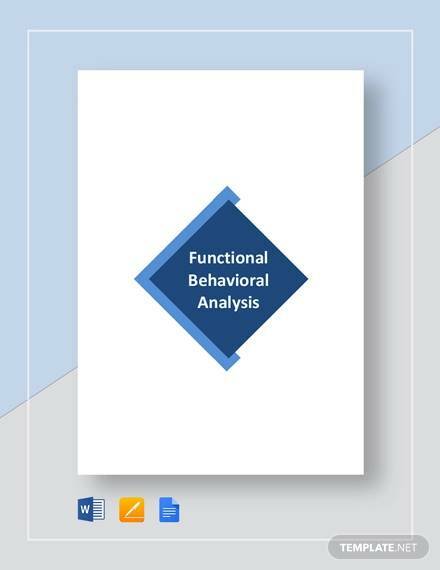 To write a functional behavioral analysis report, one should be aware and follow a format required by the institution they work under to ensure that they only provide the needed information. Step #5: Presentation of the report and creation of ideal interventions. Once the report is completed, it is then presented to the entities involved in the analysis. This is also the time when the ideal and applicable interventions are presented so that the said behavior can be corrected or improved. Being keen on details and having excellent observation skills is the key to writing an effective functional behavioral analysis. Studying available samples and templates also helps in the improvement of ones work. Check out free samples and templates on our website, like Professional SWOT Analysis Templates, Sample Risk Analysis Templates, and Sample Cost Benefit Analysis Templates. Samples offer a lot of advantages to its users. They are not just documents for you to use as reference because they can offer things more than that. Let us check out these advantages below. It can be used as a template. Some people think that samples are for your eyes only, but they got it all wrong. A lot of samples are now available in editable file formats so they can be modified and personalized as you prefer. It serves as a guide. 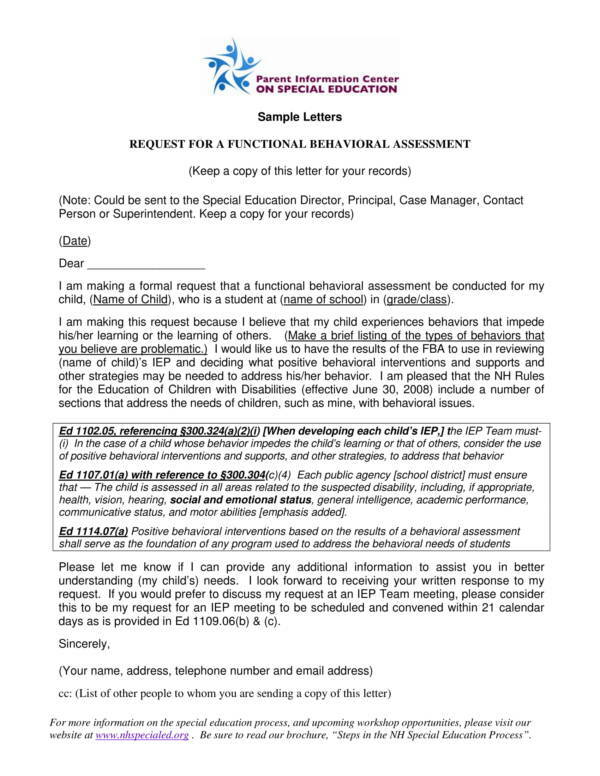 Samples are very useful guides as they can show you what should be included in your functional behavioral analysis and how it should be formatted. It will help you learn how to create your own analysis and create the steps that you are comfortable to follow. It is a good source of information or makes a good study material. Analysis samples are definitely a good source of information and study materials because most of them are from actual analysis reports that have been approved and used in actual situations. It can be downloaded online. There are plenty of different types of analysis samples that can now be downloaded online and majority of these samples are offered for free. It comes in different varieties and file format. In order to fit different needs, analysis samples are also now made available in different file formats that can be used for a variety of purposes. This makes it easy for anyone to find the sample that they need. It is created by different individuals. Every individual or entity have their own style of doing things so using a template allows you learn a lot of different styles that can be applied to your on work. In addition, these people also give their own opinions about their work so which gives you a glimpse of how think about certain things or behaviors. Samples are indeed as useful as templates. If you would like to get hold of different types of samples and templates, then you may want to drop by our website. We have their articles, like Sample Business Analysis Reports, Company Financial Analysis Template, and Case Analysis Samples.